10 Best Kayak Seats 2019 Reviewed: Are These The Best For The Money? Even the most rewarding kayaking adventure is likely to leave you with a sore back if your yak has an uncomfortable seat. That’s why you need to stop at nothing in the attempt to find an ideal seat. But what sets the best seat apart from the rest? The first and most obvious factor is your comfort. It may sound like a pretty basic requirement but to be honest, very few kayak seats out there are as comfortable as they may seem to be. Besides that, you want to settle for a yak that’s secure and reliable. It basically, should provide you the appropriate lumbar support. Most importantly it should be firmly attached to the hull for extra stability. You may not know it, but good kayaks aren’t just about comfort and safety! So, really, the list of factors worth considering goes on and on. As a first-time shopper, you might be easily mistaken to think that it’s nearly impossible to find the best match. But that shouldn’t be the case. 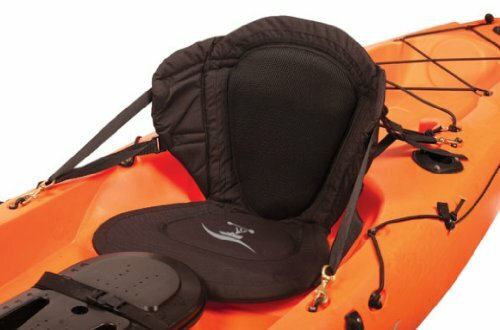 How do you go about finding an affordable fishing kayak seat? Our editors have applied their many years of yakking experience to present you with the following 10 picks. Tired of scouring the internet only to find some superficial reviews? Worry not. The following table gives you a deep and effective coverage so you can make an informed bet today. The Ocean Kayak-Comfort Plus is designed with features to give you maximum comfort for all-day kayaking. The seat has extra cushioning compared to regular kayak seats. 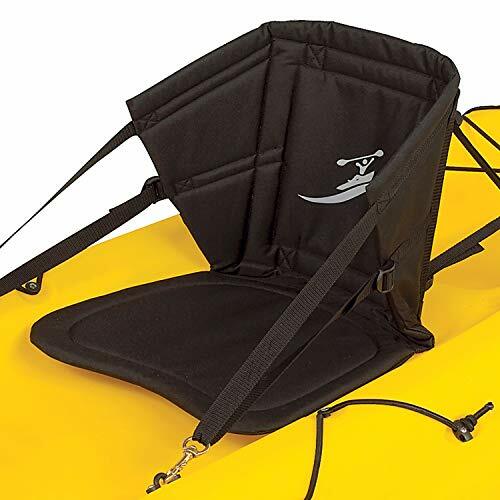 It a mid-priced, affordable seat designed for sit-on-top kayaks.The seats is constructed from nylon and enhanced with solid brass clips and stainless steel springs. It has a built-in ventilation system for keeping the rider cool and dry. In addition, the yak seat has UV-protection. For a strong back support, the back has reinforced stays, and it is long. The seat has a four-way strap adjustable system. The adjustable straps will allow you to adjust the straps as is fitting to you. Further, the logo on the seat is reflective for visibility in low light situations. The Ocean Kayak-Comfort Tech Seat is an invention from the Comfort Plus model. It is designed for sit-on-top watercrafts. The seat comes at an affordable medium price. The seat is constructed from UV-resistant nylon. It has brass swivel buckles for a secure lock. The adjustable straps allow you to custom the seat to your preference. The seat section is constructed with extra padding to provide more comfort. The seat has a tall back to provide extra back support. 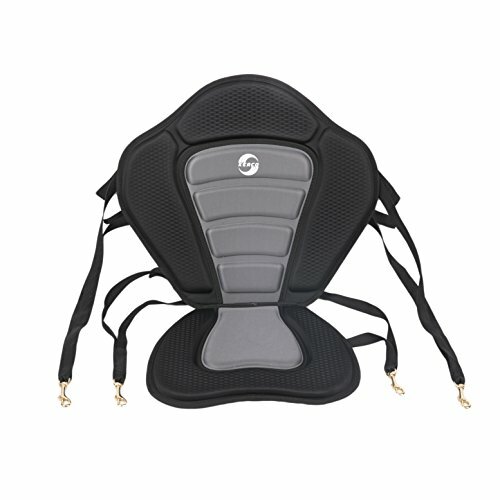 In addition, the back seat is reinforced with stays to provide more back support. The seat has a built-in ventilation system which allows air circulation to keep you cool and dry. Besides that, the logo is reflective for visibility in low light situations. 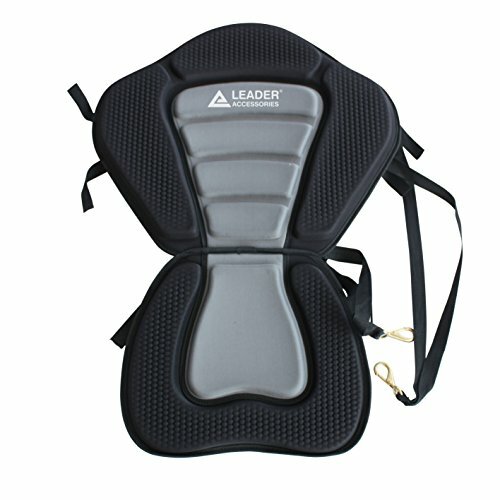 Enjoy your water adventures with the Leader Accessories Deluxe seat. The seat is constructed with special features to support your back and bottom in sit-in-kayaks. This moderately priced seat is also manufactured for durability. It has marine grade brass straps to keep you riding and secure in all weathers. It also has molded foam padding for ultra comfort. The seat’s design fits someone’s natural body contour. In addition, the seat has a high backrest rest of 18 inches, to suit riders of different sizes. The seat has four adjustable straps, two straps in the front and two at the back for a secure lock. In addition, it has adjustable webbing. 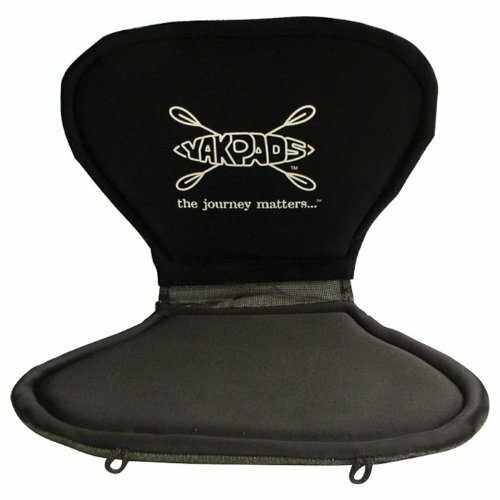 Enhance your next kayaking adventure with the Yakpads Gel-filled seat. The gel-filled seat cushion will increase the comfort levels of your sit-in-kayaks. It is a medium priced seat that works excellently by providing extra cushioning to the thighs and back to ensure you maintain a good posture. In the process, it reduces backaches and bottom pains associated with long rides. The seat has a non-skid base made from soft neoprene and soft lycra-face. The seat is soft and yet thin. The softness provides you with the needed comfort on a kayaking ride, and the thinness avoids bulkiness for your convenience. The back is fitted with buckles for a secure lock. Unfortunately, though it is branded as a high-backrest seat, the length is shorter compared to other models. Vibe Kayaks Deluxe Padded will make you enjoy long paddling hours on the waters. It is a pocket-friendly kayak seat designed to fit in your sit-on-top kayak. The seat is made from nylon which has UV-protection for durability. The seat weighs 3 pounds. The height of the back seat is 18 inches long, and its width is 19 inches. The long back seat provides maximum back support. The front and rear of the seat is fitted with four thick adjustable UV-protected straps. In addition, it has snaps made from marine grade solid brass for a sturdy connection. The order includes a detachable bag that has water resistant features due to its wax coating. You can use the bag as a dry goods compartment. Have a comfortable kayaking day with the Surf to Summit GTS Expedition seat. The seat suits sit-on-top kayaks. The seat is designed for the ultra support of your back and bottom for maximum comfort. It is manufactured from thermoformed fabric, plastic, and foam which is a blend of hard and soft materials to form a durable and comfortable seat. The bottom and back come with extra padding for your comfort. The seat back height is long with 18inches. The bottom seat is 2 inches thick. The bottom seat has channels which act as drainage for the seat. The seat has a secure, adjustable strap lock system to prevent seat-slips and provide a customized fit. It comes with a built-in pouch for additional storage. Unfortunately, compared to most other brands in the market, it is quite expensive. Enjoy the comfort of the iROCKER Inflatable in your SUP. The seat fits in all SUPS (stand-up-paddle) kayaks with D-rings. The seat is designed from durable materials and with an ergonomic design for all-day comfort. It is an easy to install the seat that takes a few minutes to pump to get set. 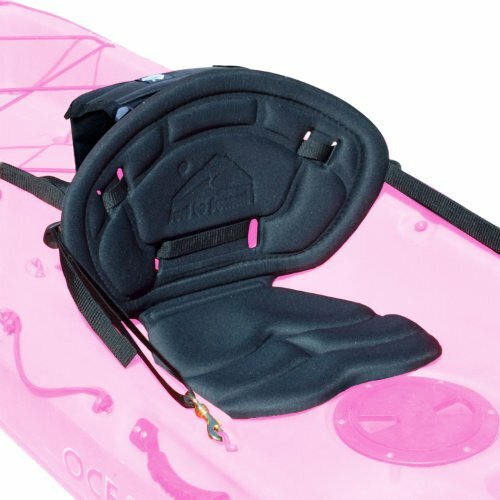 The yak seat is constructed from thick-cushioned Neoprene material for durability. The seat weighs 2.8 pounds, and its dimensions are 19.1 by 14.6 by 5.5 inches. It comes with two clips and four adjustable straps to fit all riders of all sizes. The straps also provide a secure fit to the kayak. Unfortunately, though its price is in the medium range, the price is still not pocket-friendly. Surf To Summit-Outfitter Series is designed with durable features for a long-lasting kayaking use. It is among the strongest and long-lasting kayak seats in the market. It is a moderately priced seat that is quite affordable and comes with a lifetime warranty. The seat is made from layered fabric, foam and plastic. The seat is molded at 400F using 60 tons of pressure. The pressure and heat bonds the fabric to the form completely. In addition, the material is quite comfortable to the feel. The seat has a four-point adjustable attachment system to fit all sizes of people. The seat back is 13"L x 20"W and the bottom is 14"L x 16"W x 3/4"H. Besides that, it is designed with good back support for all-day comfort. 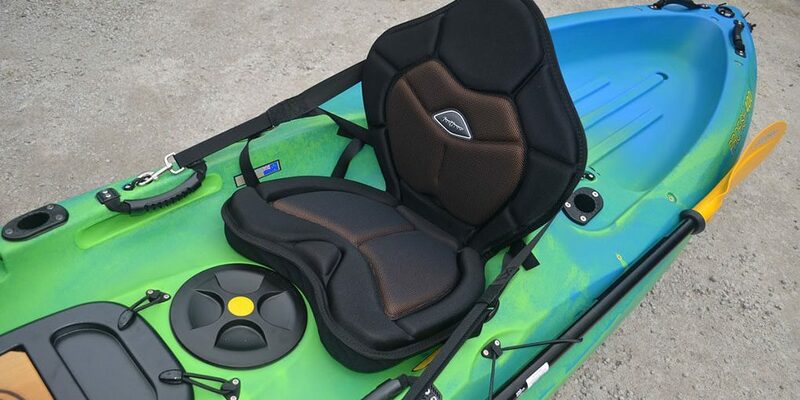 Kerco Explorer is a budget kayak seat best for sit-on-top kayaks or paddle boards. The seat is made with durable and comfort features. 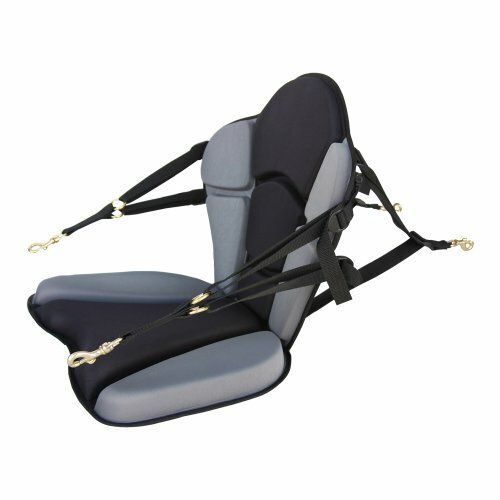 The seat is designed with four adjustable, heavy-duty, thick straps. The adjustable straps make the seat compatible with most sit-on-top models. The seat comes with a small detachable pouch. The inside is made from molded form, while the exterior is nylon. The nylon makes the seat dry fast whenever it gets wet. It has a shipping weight of 3.4 pounds. 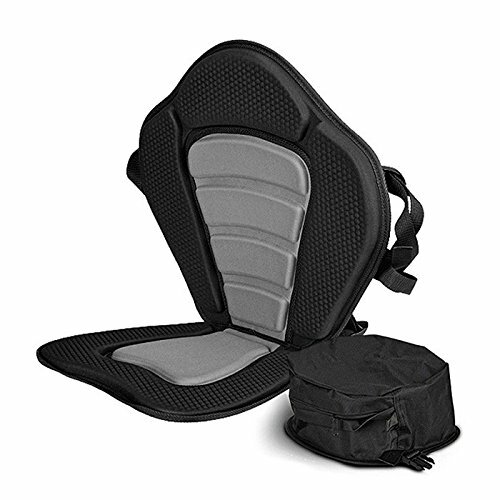 The seat bottom is 13"L x 15"W x 1"H and the back seat is 18"L x 21"W. The long back seat is constructed with enough padding to support your back well and prevent backaches and pains. Paddle longer with the YakGear-Manta Ray kayak seat. The seat is compatible with sit-on-top kayaks and canoes, thanks to the brass buckles and D-ring placement. Two built-in D-rings provides an easy connection. However, to fit in a sit-in-kayak, you need to install a five piece pad eye kit. The back of the seat is tall at 19 inches and adjustable and comes with one-inch thick padding. 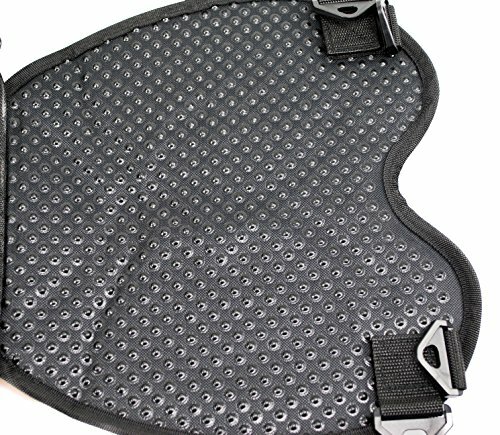 The non-skid bottom features a 1-1/2 inch thick EVA Foam for comfortable all day paddling and is 15 inches wide. The seat has water gutters to channel waters away. Although you may not have given much thought about it, the correct sitting position can significantly affect your wellbeing when kayaking. That’s why you first of all need to know how to do it, the right way. Most importantly, before you head out for your next trip, we’d recommend keeping the following factors in mind. To do this, you need to begin by adjusting the back brace. Ideally, the brace should be loose but still supportive. Besides that, it’s important to adjust the foot supports (or pegs). Ideally, the foot pegs should be positioned comfortably within the reach of your foot when sitting comfortably. Before you embark on any trip, we’d suggest test-fitting the setup. This should be done when wearing your best kayaking shoes. You want to make sure that your back and butts are comfortable. However, if you notice that anything is affecting your comfort for whatever reasons, get out and re-adjust it. The backrest is extremely important because besides supporting your lower back, it also provides essential support to your lumbar. A lack of proper support for this important region could lead to the emergence of sciatic pain. This can ultimately lead to numbing of feet and significantly affect your quality of life. Just to make sure that your feet and legs are perfectly positioned, be sure to run the following simple checks. First and foremost, make sure your toes are pointed outward. Your heels should definitely be slightly angled toward the center of the yak. What about the knees? Well, the best knee position for kayaking is one where the knees bend upward and outward. This position effectively enables your legs to apply pressure on the thigh braces. Ultimately, the position enables you to balance out the pressure on both your feet. It also provides you with a better opportunity for a proper orientation. Now that you know a thing or two why not learn the specifics of picking the right seat for your watercraft? Ready to go? Well, here now are the key factors to always keep in mind when looking for the right replacement for your yak. It’s always important to factor in the size of the seat versus the size available in your cockpit. We’d, therefore, generally recommend going for a standard size. However, if your kayak is huge and designed for big bodied people, you can always go for the next big seat. All you want to make sure is that the seat perfectly fits within the space available in the cockpit. You don’t want anything that’s especially too large. Marine seats come into contact with all sorts of challenges. We’d, therefore, recommend for the highest quality of material available. Ideally, the material should be water-proof and comfortable at the same time. For instance, you can go for a nylon seat with interior padding. One thing to note about nylon, however, is that it might come with breathability issues. For that reason, you want to go for one that comes with a built-in ventilation system. Ultimately, such a paddler would help keep you cool and dry. Just like the hull of your yak, the surface of your seat should always be UV protected. This kind of protection helps prevent fading or premature wear or fading. So, before you settle for any seat brand, be sure to double check on this all-important requirement. The ideal kayaking seat is one that’s adjustable. This kind of flexibility gives you the extra freedom you need to ease pain from your back. Most importantly, it provides you with the opportunity to make adjustments that help you avoid lower back pain. One specific kind of seat we recommend is one that offers a 4-way adjustability. That’s sometimes all the freedom you need especially when embarking for long fishing trips. One thing you need to ask yourself is whether the seat is easy to install or not. The reason why this is an extremely important factor is that it significantly affects your convenience and safety. You don’t want to end up with a seat that’s too difficult to install. Secondly, you don’t want to end up stuck with a seat that compromises on your comfort and safety. Therefore, we’d recommend going for a seat that comes with handy swivel buckles. The buckles should be made of a high-quality material such as brass or high-grade aluminum so it’s corrosion-resistant. We have already mentioned this factor but we think that it’s extremely important to emphasize it. When it comes to outdoor events, your best bets in terms of clothing and seating materials are ones that are breathable. Some people argue that this is an important factor to consider over waterproof and windproof features. The term breathability simply means the ability to release vapor and moisture. That way, you can get active without worrying that the seat will overheat and feel uncomfortable. That said, a breathable kayak seat won’t stop you from producing moisture or sweating. Those are natural, body responses. There’s no way to completely and permanently prevent water splashes on the kayak. For that reason, it’s always advisable to go for a seat that’s designed to be waterproof. Such a seat should also be easy to clean – ideally, it should be cleanable with just a few wipes. One seat that seems to tick all the right boxes in terms of quality is the Ocean Kayak Comfort Plus. 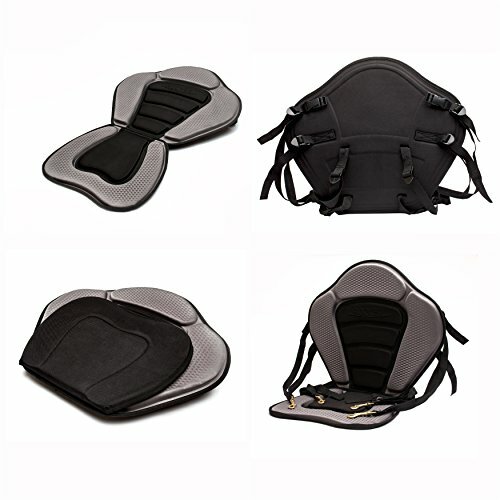 The highly rated seat comes with a generous back support along with adjustable straps. The seat further boasts a tough nylon construction, brass swivel buckles as well as 4-way adjustable mounting straps. Whichever way you look at it, comfort is the number one factor that matters when choosing the best seat for your kayak. So, no matter the situation, don’t compromise on this. Besides that, durability, ease of maintenance and aesthetics can also sway your final verdict.